This is a simple option agreement that creates a right to buy real property at a set price within a certain time period. It is easy to use, designed specifically for situations where the other party is likely to be less confident in dealing with complicated "legal" matters. Option agreements are unusual documents in that it is generally the buyer that proposes the terms and sells the deal to the property owner. The buyer therefore has the problem in deciding how far to push for terms. Sometimes a long legal document can be a hurdle to get the deal signed quickly. This is an option agreement to buy real property - land and/or buildings - specifically drawn to be short and simple, for situations where it is important not to present the other party with a full legal agreement that he may worry about. This document does create a legally binding agreement, but does not tie up the loose ends as our other versions do, and does not offer as much protection for the buyer from the unexpected. It is, however, short, written in plain English and therefore easy to understand. If simplicity and ensuring minimal friction with the other side are crucial, use this document rather than one of our other property option agreements. 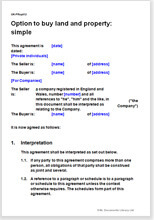 The document also includes a template notice of exercise letter, to be used by a buyer to exercise the option before the expiry date stated within the agreement.